Looking back five years ago is hard when you didn’t do anything five years ago. Oops. Six years ago had some cool stuff! Mr. Smith was kind enough to be the first person to open up about his passion for M.U.S.C.L.E. collecting for the first entry in Sociology 300. A part of the website that has sadly died. Sociology 300 hasn’t had an update in five years. And the Sociology section overall hasn’t had an update in three years. I always like that part of the website. It is sad for me to think it is mostly dead at this point. And Auction Watch #16. It was an auction that highlighted the importance of diligence and resourcefulness for a M.U.S.C.L.E. collector. Today it reminds me that I had WAY more time on my hands six years ago. 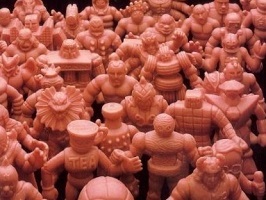 It also reminds me that I was having more fun with M.U.S.C.L.E. figures. I don’t believe that is ever going to happen again, but fun is the focus more than ever. If I’m not having fun, then why do it? I am having more fun with the site – maybe more than ever. I also feel a bit of pride and/or self-satisfaction that the fun isn’t coming from buying something. It’s coming from doing something. I like that. This entry was posted on Saturday, October 3rd, 2015 and is filed under UofM News. You can follow any responses to this entry through RSS 2.0. You can skip to the end and leave a response. Pinging is currently not allowed.